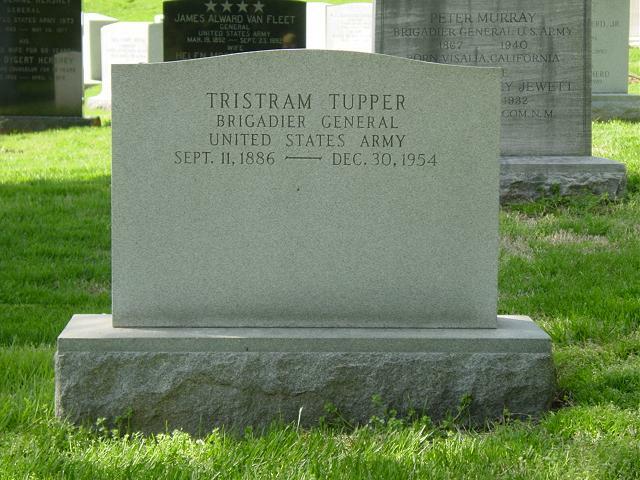 Tristram Tupper was a writer and screen-writer who served in World War II as an Army Brigadier General. He was the brother-in-law of Army Chief of Staff General George C. Marshall. Tupper's spouse was Clara Tarbell Tupper. He is buried in Arlington National Cemetery in Section 7 near General Marshall. 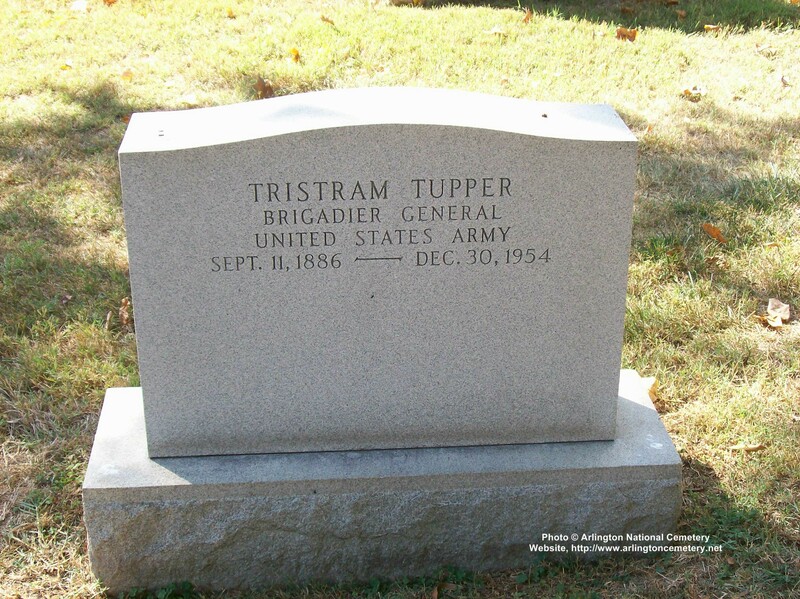 WASHINGTON, December 30, 1954 – General Tristram Tupper, U.S.A., retired, brother-in-law of General of the Army George C. Marshall, died today at his home in Miles, Virginia. He was 66 years old. The general, who retired in October 1945, was a veteran of service on the Mexican Border and both World Wars. He was a native of Caroline County, Virginia. Although a 1912 graduate of New York Law School, General Tupper turned to writing after World War I. For fifteen years he wrote scenarios for Fox, Republic and Universal Pictures. He was also the author of several books. After his retirement, he set up the publishing firm of Tupper & Love in Atlanta. Survivors include his widow, Mrs. Marion Ferrill Tupper, two children by a previous marriage, Tristram Tupper, Jr., of Los Angeles and Caroline Turbell Tupper of Van Nuys, California, and two sisters, Mrs. Katherine T. Marshall and Mrs. Sterling Lacy of Leesburg, Virginia.